Police officers searching for a robbery suspect at an apartment complex in the 500 block of Ashlawn Drive were fired upon after spotting the man they were looking for, said a police spokeswoman. At 7:39 p.m., police were searching the complex when they saw the suspect and he reportedly fired a gun at officers, said Karen Parker-Chesson, police spokeswoman. She did not know whether officers returned fire. The man then fled on foot to East Little Creek Road and headed west but was apprehended by police a few minutes later in the 500 block of East Little Creek, she said. His identity was being withheld because he is a person of interest in several other incidents, including the robbery that police were initially investigating. It’s Fall Kick-Off Time at Wards Corner! Clean Our Corner Trash Bags, safety vests, gloves, snacks & water will be provided. RAIN DATE: Sunday, Oct. 11, same schedule. The East Little Creek Road Corridor between Wards Corner and Wal-Mart is becoming a gun range with humans as targets. Two murders this week in the 800 block of Banaker Road. One murder last week in the 300 block of Fort Worth Avenue and today, Saturday, another shooting in the 800 block of East Little Creek Road. Click here for story. Why isn’t Norfolk going to war on this dysfunction that is becoming a part of every day life in our area? Is it because most of the killings and shootings involve black folks? If this criminal activity were taking place in Downtown, you want to bet that the Mayor and several City Council folks would have their mugs all over the television news. Case in point – The Granby Theater shooting in March of 2007. All hell broke loose in the city’s officialdom. Click here for story . Why is violence in one part of the city dealt with severely and in other areas almost ignored? One answer is institutional racism. Black folks killing each other in Norfolk is ok as long as it doesn’t effect the economic development efforts in Downtown. The Virginian-Pilot is reporting that Alton Joe “AJ” Lacy is wanted on murder and firearms charges. Lacy is accused of killing Troy A. Booker, 22, in the 300 block of Fort Worth Avenue in Denby Park on Sunday night. Police described Lacy as a short-haired, dark-skinned black man, 5-feet-7 and 210 pounds, with at least two tattoos: “wisdom, beauty, strength” on his left arm, and “M.O.B.” on his right bicep. He frequents Denby Park, Berkley and Tanners Creek, , but his last address wasn’t known, Amos said. Police asked anyone with information to call Crime Line at 1-888-LOCK-U-UP (562-5887). Wards Corner Now previously reported on this murder on September 13, 2009 in “Homicide in Denby Park“. Unfortunately I cannot be at the meeting on Wednesday (patient care); so here is my input. I know you all are passionate and dedicated to see this through, no one is more committed than me. 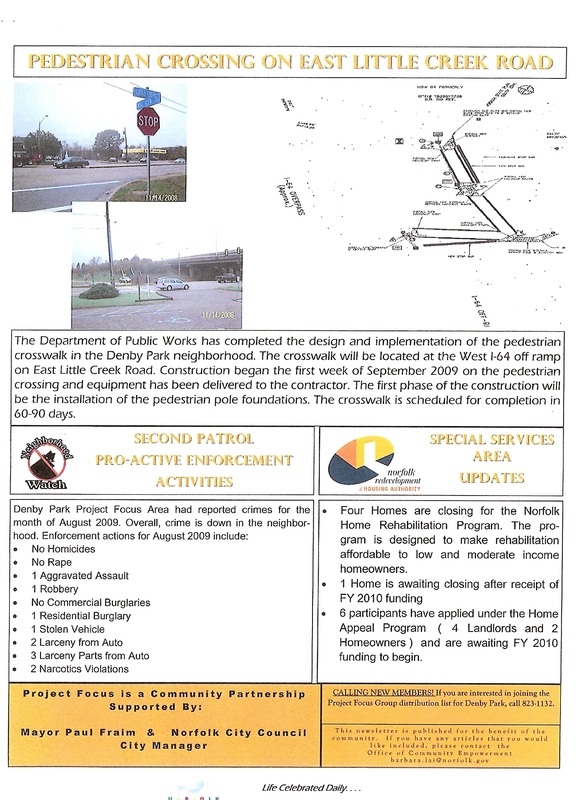 No, I am not “proud” of Wards Corner as it looks today but I am a property owner and a home owner in WC and I will continue to work diligently for its improvement. What is holding Wards Corner back is the lack of a “Big Fish”; someone with deep pockets AND the desire to go in and take the risk of several million dollars to redevelop Wards Corner. Once the first fish comes in the others will follow. Remember, Mrs. Dallas was offered 12 million dollars for her corner 10 years ago and turned it down. I agree with you that things are not moving forward as fast as we would like but we must be careful not to gather a lynch mob against Barclay, Don and Theresa. Reading an inflammatory letter in a public setting was like an ill-advised intervention and is not going to change the city’s behavior toward us. In fact, I’ve seen the results of that type behavior from previous Wards Corner leadership. I would argue that is one of the reasons we have had such slow progress here and we are still may be paying for it. Praise in public and chastise in private. If you have a beef with our council people get on the phone, make an appointment at their office or grab them after a meeting in private but not in a public setting. No one wants to be “spanked” in front of other people. I have no problem reorganizing the task force back to committee structures if you think that is the answer. In my opinion there won’t be any major changes in the Wards Corner business district until the property owners decide to pull the trigger and sell or tear down the shopping centers and start over. According to Chuck Rigney, once a developer comes to them with a plan, the city will use all of its resources to see it happen. I believe him. Unfortunately the current economic market makes this next to impossible. Unless the city owns the property there isn’t a whole lot they can do. As far as businesses moving out of Wards Corner, it isn’t because of the crime necessarily, it is because there are better opportunities elsewhere from a construction/structure stand point. Businesses are offered only short term leases with little support from property owners (you have to do your own build out). Look at the business that left; Wherehouse Music (that type of store is fading fast – see Virgin Records at Disney World…gone! ), the Hispanic store on Little Creek (illegal activity), the rent to own store in the Perry Property (dying business), the real estate office on Granby, (market shakeout). The reason the Sport Zone left had little to do with the prostitutes and gun shots; they were plagued with shoplifters and they had a better offer in Ghent. The stores on the Dallas side….. well, we know the problem there. So get ready, it may get worse before it gets better. Unfortunately, these are factors completely out of our control. What we DO have control over is reporting crime and code violations to the police and public works departments respectively. Then we have to hold their feet to the fire to rectify the violations. I believe the continuous updates from the people in Denby Park led to the money currently being spent in Denby Park and Monticello Village. We need to keep providing our opinions but in a more appropriate manner (to say NOTHING has been done in Wards Corner is disingenuous). I believe the beautification and infrastructure committees have done a good job creating workable plans for Wards Corner and the Wards Corner Now web site if utilized properly is a strength. The city did buy the Alexis Apartments (paid way too much for them) and it would be nice but improbable for them to buy up large pieces of property in Denby Park. Losing Marcus to Richmond definitely set us back. From my perspective, I’ve seen a lot of complaining and very few solutions from the citizens of the task force. I would suggest you list your concerns and define workable solutions. Then communicate those desires firmly but professionally. I know when I am nagged I am less likely to capitulate. A lot has changed economically and politically since the development of the WC Comprehensive Plan. We need to regroup and move forward in a positive fashion. Yes, there have been mistakes and missed opportunities along the way but whining about them will not change the realities of today. Don’t forget the comprehensive plan suggested we focus on the fringes first (DP and Tittustown) then the core will follow. Lastly, if you believe some or all the council members need to be replaced; don’t talk about, do it. You are currently browsing the Wards Corner Now - Wards Corner, Norfolk, Virginia blog archives for September, 2009.